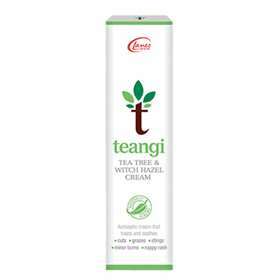 Lanes Teangi Tea Tree and Witch Hazel is an antiseptic cream that cools and soothes whilst also relieving pain and itching from things such as; cuts, grazes, nappy rash and minor burns. Tea tree and witch hazel. Apply generously several times a daily when needed and at bedtime. For cuts and wounds, wash area first. Do not use if sealed tube has been damaged. Witch hazel 40.61%, Eucalyptus oil 1.04%, Methyl salicylate 1.04%, Camphor 0.52%, Tea tree oil 2.5%, Zinc oxide 3.11%, Chloroxylenol, Emulsifying wax, Lanolin, Levomenthol, White beeswax, White soft paraffin.